4" x 16" Tin Plated Copper Ground Bar Kit with 72 Holes. The hardware kit includes 2 standoff insulators, 2 mounting brackets, 4 stainless steel bolts, and 4 lockwashers. Meets BICSI and J-STD-607-A Requirements for Network Systems Grounding Applications. 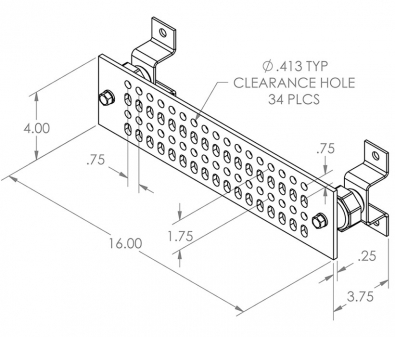 Assembly can be installed as Telecommunications Main Grounding Busbar (TMGB).